You’re guaranteed to love our hidden beach hide-away right on the Gulf of Mexico. This family-friendly resort is a gated, vacation community offering thousands of feet of private, white beach frontage, natural sand dunes, and beautiful landscaping. Activities are available for all ages and the Plantation is perfect for family getaways. Our privately owned, 2BR/2BA nonsmoking condominium is updated and decorated with your comfort and convenience in mind. The modern roomy kitchen is fully equipped with all major appliances, small appliances, dishware and flatware. The master bedroom has a private bath, queen-size bed, and 29" flat screen. The guest room also has a queen-size bed and private bath. Additionally we have a double air mattress and a folding cot, ideal for children. The living room is nicely decorated and also has a 32" flat screen television. Our condominium at the Gulf Shores Plantation promises each guest a wonderful island-style vacation on the Gulf of Mexico. 24-hour on-site security, six outdoor swimming pools, one indoor swimming pool, seven lighted tennis courts, one lighted basketball court, beach volleyball court, shuffleboard, horseshoes, two outdoor hot tubs, three indoor hot tubs, sauna, steam room, restaurant, beach store, umbrella/chair rental on the beach, outdoor barbecue grills, conveniently located laundry facilities & free wireless internet throughout the resort. Play 18 at the nationally ranked Kiva Dunes Golf Course, which is rated as one of the Best Public Courses in the country by Golf Digest Magazine. Kiva Dunes is located adjacent to the property, within walking distance of our condo. Please inquire with any questions you may have. Also please check our reviews to see what previous guest are saying about our condo at the Gulf Shores Plantation. Wayne & Julie Webster are originally from Utica, Michigan and currently reside in Spring Hill, TN. They have been coming to the Plantation for over 16 years. We came here for a weekend getaway in 2003 and absolutely fell in love with the resort. The low-rise units and expansive beach allowed for a very uncrowded vacation experience. We came back a month later and found our home-away-from-home. No regrets ever and now our adult children bring their families to vacation here. The Gulf Shores Plantation Resort is set away from the hustle and bustle of downtown Gulf Shores, AL. This is why it is the perfect get away spot for people who appreciate a quite, family friendly beach experience. Our low density, low rise condos and expansive beach on the Gulf of Mexico means no crowds for you to deal with. The Plantation offers 7 swimming pools, 7 tennis courts, basketball courts, horse shoe pits, barbecue grills, whirlpools, on-site restaurant and is adjacent to the renowned Kiva Dunes Golf Course. toilet, combination tub/shower, tub, Private. attached to the Master Bedroom. This family-friendly resort is a gated, vacation community offering thousands of feet of private, white beach frontage, natural sand dunes, and beautiful landscaping. Enjoy a beautiful view of the east pool and the beach from our private balcony. The Gulf Shores Plantation is located directly on the Gulf of Mexico. Just outside of our unit is the boardwalk that will take you across the dunes to the sugar white sand beaches. Linens are provided but are not exchanged during your visit. Coin operated laundry facilities on every floor. Located very convenient to our unit. Convenient parking close to entrance of our buliding. Free Wi-Fi throughout the resort is available. Kitchen & bath towels are provided but are not exchanged during your visit. 3 story low-rise condominium with handicap ramp, stairs and elevator. Equipped with 32" flat screen TV. sofa and two comfortable chairs. Built in dishwasher for your convenience. Full size refrigerator in kitchen. Coffee maker is provided. Remember to bring filters and coffee when you come. Kitchen is fully stocked with cookware, dinnerware and flatware. The modern roomy kitchen is fully equipped with updated kitchen cabinets, counter tops and major appliances. We are also fully stocked with cookware, dinnerware and flatware. High-top dining table in dining area. 32" flat screen TV in LR and 29" flat screen in MBR. Free cable TV with movie channels. Private balcony off the living room. Gulf Shores Plantation Resort has seven lit Tennis Courts available onsite. Also lit basketball and shuffle board court. Play 18 at the nationally ranked Kiva Dunes Golf Course, rated as one of the Best Public Courses in the country. 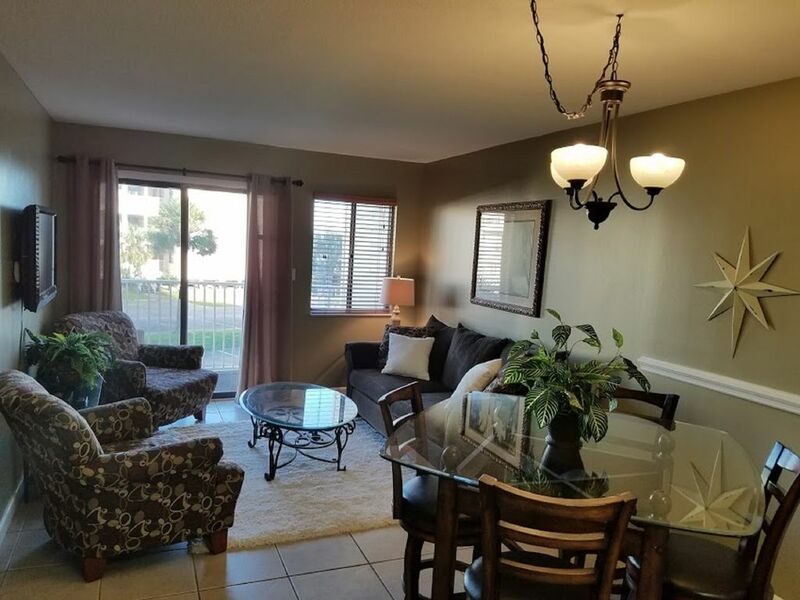 Kiva Dunes is located adjacent to the property, within walking distance of our condo. Gulf Shores Plantation Resort has seven swimming pools one of which is located inside a beautiful Geo-Dome in building four. All 7 pools are available for your enjoyment. AMENITIES AT THE PLANTATION RESORT: 24-hour on-site security, six outdoor swimming pools, one indoor swimming pool, seven lighted tennis courts, one lighted basketball court, beach volleyball court, shuffleboard, horseshoes, two outdoor hot tubs, three indoor hot tubs, sauna, steam room, restaurant, beach store, umbrella/chair rental on the beach, outdoor barbecue grills, conveniently located laundry facilities & free wireless internet throughout the resort. Play 18 at the nationally ranked Kiva Dunes Golf Course, which is rated as one of the Best Public Courses in the country by Golf Digest Magazine. Kiva Dunes is located adjacent to the property, within walking distance of our condo. This condo is in a nice quiet location. Right on the beach, which is what we wanted and only 20 minutes from the action of Gulf Shores. Easy travel to restaurants and site seeing venues. Condo was clean and tidy. Great place! Hope to return next year! We had never gone to Gulf Shores before and we LOVED it! We enjoyed our stay here as well! It was clean and just like the pictures. Like other reviews there could be some updating, but it didn't hinder our stay! We enjoyed being just a boardwalk away from a private beach and the drive to the main drag is nice and not that far away! They were working on the hot tub so it wasn't open the whole time so that was a bit of a bummer... The owners, Wayne and Julie, were prompt to answer questions and great to work with. My family and I traveled gulf shores Plantation for spring break and were lucky enough to stay in #2213. The place was perfect. Just quite enough for a family but not too quite for a family if you know what I mean. It was close enough to the attractions but far enough away for some really awesome times on an uncrowded beach. Highly recommend this place to anyone who needs a spring break place for their family. The condo was clean, safe, and convenient. We came early in the season, so the beaches were not packed. Area attractions were a short, relaxing drive. For a family of five, we fit nicely and had plenty to see and do. We hope to be back again, as this was truly a nice home away from home. We recommend the Gulf Shores Plantation to you and your family. Our family stayed at this condo for Spring Break, and it was perfect for our needs. The condo is a very short walk (50 yards?) from the boardwalk over the dunes, and you pass two outdoor pools on the way. The indoor pool was great in March for the breezy days that my kids wanted to play in warmer water. The condo was clean, well appointed with dishes and cookware, clean, and comfortable. The furniture was in good condition, and there was plenty of space in the kitchen for our family and another family who traveled with us to cook and eat together. The full-size oven and full-size fridge came in handy. The balcony gave us a little bit of extra sitting space, but the living room and kitchen table were plenty big for 4 adults and 4 young kids to eat and lounge after dinner. The bedrooms are a bit tighter - no "extra" room - but we didn't spend time in there. The one improvement I would recommend to the owner is to fix the screen door to the patio (which is broken and falls off the rails) and replace the screen in the master bedroom (since it has holes in it). Otherwise, everything is in very good condition. I would recommend this condo for families. The range needs to fixed or replace -oven didn’t work right. Sometimes it would burn and then wouldn’t heat up, we even bought a oven thermometer and it didn’t help. The balcony door did lock. Many floor tiles cracked. Who does your cleaning the dishes looked like they hadn’t been clean maybe because not used much. Since we were there for a month we did more cooking. Also it would be nice to have more than four cups. The pottery place have them for sale also we bought hot pads there weren’t any. They also have coffee pots reasonable for sale I advise myounto purchase one. I love the Gulf Coast and have stayed in town and at Plantation for years but sad to say this was the worse place we stayed. I call the lady about something to do about cable when we first came she texted me said she was out of town and take care of it myself which I did. So I fit it would be useless to call her again. Your furniture was nice but the physical structure and appliances need fixing or because repair is costly replacement. Sorry about this review but I think you want to know. Julie and I are sorry that we did not meet this guests expectations. We would like to address the items mentioned. After inspection today we found the oven & stove checked out and it is working as it should. The lock on the balcony door was loose but worked. It is being addressed today. We do provide a coffee pot for our guests and it is on the counter. We are aware of the some of grout coming up in the bathrooms and we actually have a plan to do new floors and other updates after this season. Regarding the cable going out that is something that is out of our control. The customer did contact our cleaning service and they both agreed it would be best to call the cable service directly. As far as cleanliness of anything in the condo we stand by the hundreds of positive reviews we have from previous customers. We also keep open lines of communication with our customers and really wished they would have contacted us sometime during their month long stay so we could correct any issues they were having. To any potential guests interested in staying at our Gulf Shores Plantation condo we welcome any questions you may have.